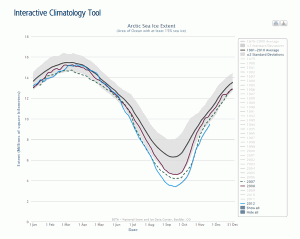 Arctic sea ice extent for February 2011 tied with February 2005 as the lowest recorded in the satellite record. Sea ice extent was particularly low in the Labrador Sea and Gulf of St. Lawrence. In contrast, winter snow cover remained extensive in many parts of the Northern Hemisphere. Sea ice extent averaged over the month of February 2011 was 14.36 million square kilometers (5.54 million square miles). This was a tie with the previous record low for the month, set in 2005. February ice extent remained below normal in both the Atlantic and Pacific sectors, particularly in the Labrador Sea and the Gulf of St. Lawrence. While ice extent has declined less in winter months than in summer, the downward winter trend is clear. The 1979 to 2000 average is 15.64 million square kilometers (6.04 million square miles). From 1979 through 2003, the February extent averaged 15.60 million square kilometers (6.02 million square miles). Every year since 2004 has had a mean February extent below 15 million square kilometers (5.79 million square miles). While ice extent grew at average rates for February, the overall extent remained anomalously low. Air temperatures over most of the Arctic Ocean were between 2 and 4 degrees Celsius (4 and 7 degrees Fahrenheit) higher than normal. Over the East Greenland Sea and north towards the Pole, air temperatures were 5 to 7 degrees Celsius (9 to 13 degrees Fahrenheit) higher than normal. Colder conditions, 2 to 6 degrees Celsius (4 to 11 degrees Fahrenheit) below average persisted over western Eurasia, east-central Eurasia and some of the Canadian Arctic. As air temperatures dropped in the eastern Canadian Arctic in February, parts of the Labrador Sea started to freeze over. However, the Gulf of St. Lawrence remained mostly free of ice. As during winter 2010, when Environment Canada reported that sea ice in the Gulf of St. Lawrence was at the lowest level on record, the lack of ice will make it difficult for harp seals to give birth to their pups on the sea ice, as they normally do in February and March. February 2011 tied February 2005 for the lowest ice extent for the month in the satellite record. Including 2011, the February trend is now at -3.0 percent per decade. Through most of January, the Arctic Oscillation (AO) was generally in a strongly negative phase, similar to the pattern that dominated the winter of 2009 to 2010. This led to very warm temperatures over the eastern Arctic, helping to account for the low ice extents over the Labrador Sea and Gulf of Saint Lawrence. However, toward the end of January, the AO returned to a positive phase, and ice began to grow in the Labrador Sea and Gulf of St. Lawrence. For more information on current AO conditions, visit the NOAA Climate Prediction Center Web page. Typically during a negative AO phase, weather patterns favor the retention of thick ice in the central Arctic and Canada basin, where it can better survive the summer. The negative AO also typically leads to a stronger Beaufort Gyre, which helps move ice from the western to eastern Arctic. There the ice thickens, ridging and rafting against the Siberian coast. Last winter, the AO was in its most negative phase since at least 1951. However, slight differences from the typical AO pattern in the location of the sea level pressure anomalies had a significant impact on how the ice moved within and out of the Arctic Basin. During winter 2009 to 2010 the peak pressure anomalies were shifted towards the Barents and Kara seas, which helped transport ice from the Canadian Arctic towards the southern Beaufort and Chukchi seas. Since some of the oldest and thickest ice in the Arctic is found north of the Canadian Archipelago, this atmospheric pattern ended up further depleting the Arctic of its store of old, thick ice as that old ice melted during summer in these southerly locations. This winter also saw a relatively strong negative AO index during December and January. However, as we discussed in our January 5, 2011 post, the positive sea level pressure anomalies were centered near Iceland. This led to a more extensive anticyclonic (clockwise) transport pattern than last winter. 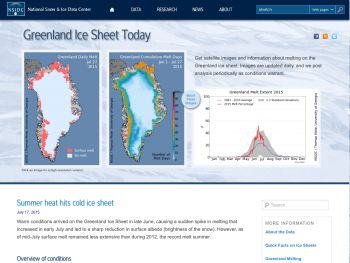 This may help keep a more extensive distribution of multiyear ice cover as summer approaches. Sea ice extent is only one of a number of data sets scientists use to understand how climate is changing. Rutgers University and NOAA have compiled a 45-year record of Northern Hemisphere snow cover extent from NOAA snow charts. These data show that much of northern North America, Scandinavia and northern Eurasia are snow covered between 90 and 100 percent of the time in January and February. High elevation plains and mountains at lower latitudes, such as the southern Rocky Mountains in the U.S. and Hindu Kush in Asia, also have extensive snow cover. Over this record, in January, Northern Hemisphere snow cover averages 47 million square kilometers (18.1 million square miles), and in February it averages 46 million square kilometers (17.8 square miles)—approximately 45 to 46 percent of the land area in the region. While sea ice extent was below average for January 2011, this month had the sixth-largest snow cover extent since the record started in 1966, at 49 million square kilometers (18.9 million square miles). Snow was unusually widespread over the mid-western and eastern United States, eastern Europe, and western China. Snow cover in February remained above average at 47.4 million square kilometers (18.3 million square miles), with more snow than usual in the western and central U.S., eastern Europe, Tibet and northeastern China. Reduced sea ice extent and extensive snow cover are not contradictory, and are both linked to a strong negative phase of the Arctic Oscillation (see our January 5, 2011 post). A strongly negative AO favors outbreaks of cold Arctic air over northern Europe and the U.S., as many people experienced first-hand these last two winters. Whether this is a trend, or in any way linked to ongoing climate warming in the Arctic, remains to be seen. Stroeve, J.C., J. Maslanik, M.C. Serreze, I. Rigor and W. Meier. 2010. Sea ice response to an extreme negative phase of the Arctic Oscillation during winter 2009/2010. Geophysical Research Letters, doi: 2010GL045662.